We are delighted to announce a world first for the Maturity Institute’s whole system, Total Stakeholder Value Model of capitalism, as we launch our project to apply mature thinking and practice across a whole, national economy. 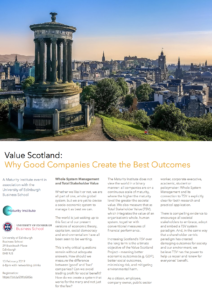 The Value Scotland project is designed to engage all stakeholders in exploring how it can be applied, in practice, to create a more enlightened, vibrant and inclusive form of capitalism in a Scottish context. The launch event, hosted by the University of Edinburgh Business School on 13th February 2019, entitled “Why Good Companies Create Better Outcomes”, will bring together business and finance leaders, academics and public policy representatives to discuss how Scotland can move to an economy focused on stakeholder value, thereby creating maximum benefit for all. See the programmes for the day here.